Thanks to chef de cuisine Timothy Vollmer for being so adventurous with baking and for allowing me into your cozy kitchen as your sous chef for this expedition and to ogle your impressive selection of cookbooks. First, just to get something straight – there is in fact a difference between a macaron and a macaroon, and it’s not just a matter of whether you are feeling snooty and want to use the French pronunciation of the word. Macaroons are yummy little coconut cluster thingys and macarons are these delightful tiny meringue burgers (more eloquent explanation here). Glad that’s sorted out. The mighty macaron always seemed to me to be an unattainable baking challenge, like a dainty orchid that could never be retrieved, lest it crush under the weight of a clumsy grip. Turns out macarons are not only quite simple to make, but are also really healthy. Crazy, huh? They pack a protein and antioxidant punch and their minimal size ensures appropriate levels of consumption, provided you have some degree of self control (or lots of friends). One thing I will say about this recipe is that the batter can be finicky, so don’t be disappointed if some of the cookies crack or deflate. Consider that you’re bestowing character upon them. Or consider it a good excuse to use the recipe over again to try for a perfect batch. Even the cracked ones taste good, so the worst that happens is that your obsession with perfection leads to more macarons than you can possibly eat or give away to your pals. This is how new friendships are made. 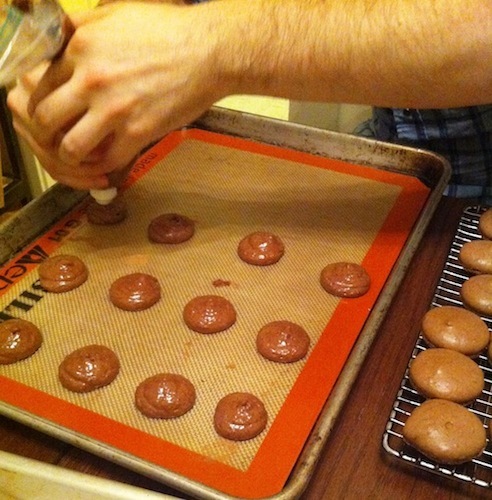 Rap the baking sheet a few times firmly on the counter top to flatten the macarons. Bake for 15-18 minutes (make sure to check at 15 minutes; if they are rounded and look set, they’re probably done). Let cool for a few minutes then move to a drying rack to cool completely. Heat the cream over a medium flame in a small saucepan with the corn syrup. When the cream just begins to boil at the edges, remove from heat and add the chopped chocolate. Let sit one minute, then stir until smooth. Stir in the pieces of butter. Let cool completely before using. You can place in the fridge or freezer to expedite the cooling process. You want it to be quite firm before spreading. 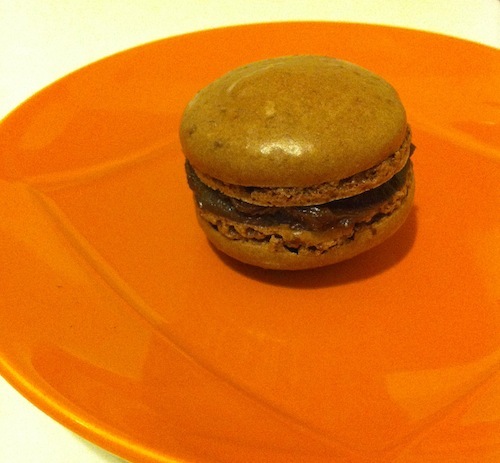 Gently spread a bit of batter on the inside of the macarons then sandwich them together. 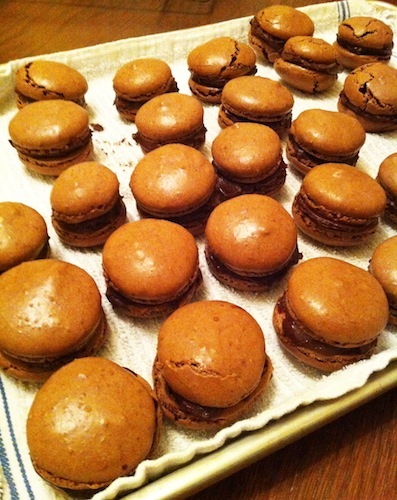 This entry was posted in Gluten Free, Not pie and tagged chocolate, macarons. Bookmark the permalink.